The following is taken and modified from FUN Manual Franciscan Theology, Tradition and Spirituality, pg 23, as well as other resources on Lectio Divina. From Gospel to Life and Life to the Gospels: since we are all about the Gospels, and we need them to transform our Way of Life, the following Lectio Divina is a recommended way of opening up the Scriptures. The Franciscan Lectio however, leads from contemplation to action (Imitatio), in other words, the gift of the Spirit provides the grace needed to transform our lives into the mind and heart of Jesus. This method is applicable for all stages of formation. Preparation: Sit in an upright position, since you are greeting the Lord. Use the formation prayer or another prayer to quiet your mind and your heart. Lectio, Reading: Select the scripture text. This may be one that is suggested in the text of the formation manual or one from the liturgy for the day. Read it slowly, stopping whenever a phrase touches your heart. Repeat the word that touches your heart with reverence. This can be read both silently and audibly. Savor the reading, taste and see that the Lord is Good. It is said that Francis, upon hearing the name of Jesus would lick his lips as if to taste the goodness in the Word (Bonaventure, Life of Francis, chapter 10). In this part of the prayer the intellect is highly engaged. This part of the prayer can be likened to a grazing animal chewing its cud. This can be what we take with us for the day to reflect upon frequently. The next part follows as one is open to gift of the Spirit. 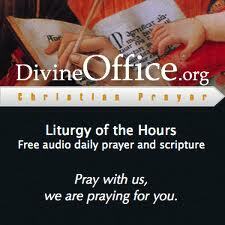 Oratio, Prayer of the Heart: In this part we are moved to offer words of praise, thanksgiving, wonder, supplications. These are not words that we can read in a prayer book, or from vocal prayers, although that might be the words that come from our lips, it is akin being awestruck and speechless because it is the work of the Spirit who is praying in us. As St. Paul describes in (Romans 8: 26-27): “In the same way, the Spirit too comes to our aid of our weakness; for we do not know how to pray as we ought, but the spirit itself intercedes with inexpressible groaning. And the one who searches hearts know what is the intention of the Spirit, because it intercedes for the holy ones according to God’s will.” This is the kind of prayer described of St. Francis, who repeated often the words: “My God and my All”. This can also be described as the moment of self-gift to the Lord, not so much intellectually, but from the heart. Contemplatio, Contemplation: this last movement is the time that we humbly welcome the Trinity who is alive in our hearts and is anxious to allow the Spirit to transform our hearts (James 1:21). This wordless hearing of the Word helps us to see the world with new eyes, so that we truly become the Beloved of the Father. It can be described as “an abiding state”. In this state one’s actions are transformed so that we imitate (imitatio) Jesus. The transition into contemplation can be a desert experience in that we realize that all of the images and thoughts about God pale in comparison to the reality. Our heart can now go into the world because we begin to find God at work within the world, and to see the Lord in our brothers and sisters. 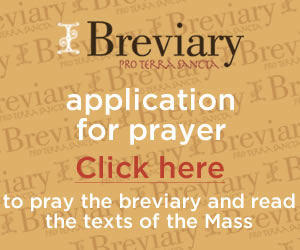 Closing: Strictly speaking this mode of prayer does not end, but at the conclusion of a time of prayer it is helpful to pray slowly the Our Father. 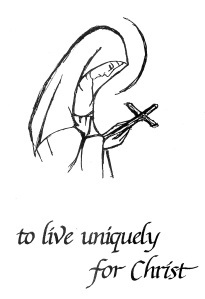 Another way of Franciscan prayer was outlined by St. Clare of Assisi in her letter to St. Agnes of Prague. This has been borrowed from Franciscan Prayer by Ilia Delio, OSF, pp. 66-69. This method can also be found in the FUN Manual “Franciscan Theology, Tradition and Spirituality”, pp. 18-30. Gaze upon: the Book of the Cross of the Crucified Christ: The San Damiano cross is one shared both by St. Francis and St. Clare. “ To gaze upon the Crucified Christ is to see ourselves, other and the world with a deep, penetrating vision—to see the truth of things in their relation to God.” Delio, pg. 67. Contemplate Him: Allow the mystery of God’s love on the Cross to open your heart to see the world and those who dwell in it with enlightened eyes in it with enlightened eyes. Let us put on the mind of Christ to see him in all that we encounter, and to return all back to him. The cross is the mirror of perfection through which we see ourselves and the world around us. Imitate Him: To be like Jesus in everything is the great work of our lives. Reflect upon how we are to become like him in his sufferings, and to bring his message of love to the world. “…we are to become vessels of god’s compassionate love for others…a mysticism of motherhood. “We are mothers when we carry Him in our heart and body through love a pure and sincere conscience; and give Him birth through a holy activity,” Francis of Assisi, Later admonition and exhortation, in Delio, pp. 68-69. 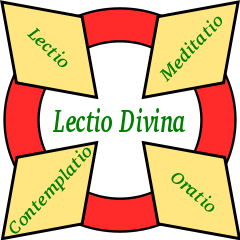 This outline is based on Ignatius’s presentation of the examen in the Spiritual Exercises (no.43). Transition: I become aware of the love with which God looks upon me as I begin this examen (As long as it takes to say the Our Father). Step Two: Petition. 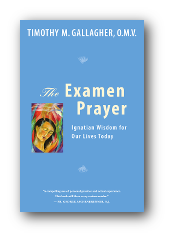 I ask God for an insight and a strengh that will make this examen a work of grace, fruitful beyond my human capacity alone. Step Three: Review. With my God, I review the day. I look for the stirrings in my heart and the thoughts that God has given me this day. I look also for those that have not been of God. I review my choices in response to both, and throughout the day in general. 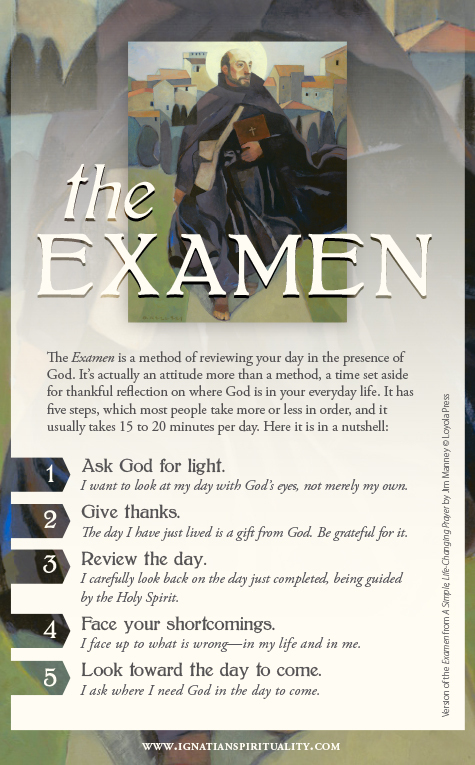 Transition: Aware of God’s presence with me, I prayerfully conclude the examen (Pray the Our Father). 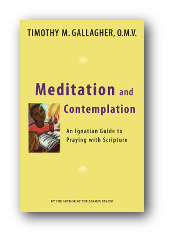 Meditation and Contemplation: An Ignation Guide to Praying with Scripture. Anyone familiar with Ignatian spirituality has heard about meditation and contemplation. In this volume, Fr. Gallagher explains what is unique to each practice, shows how you can profit from both at different times in your spiritual life, and reveals some of the forgotten elements (such as the preparatory steps and colloquy) and how the structure can be adapted to your particular spiritual needs.